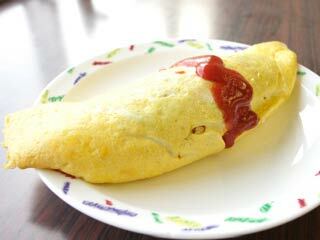 Omu-Rice is a contemporary Japanese dish consisting of an Omelette made with ketchup flavored fried rice. The name is combination of Omelette and Rice. It is one of the popular Japanese food, especially kids love Omu-Rice. The flavors of the rice could be any other taste, such as Curry flavor. You need three eggs for one Omu-Rice. Let's make the rice for Omu-Rice. Cook Onion until its color change it to orange. When Chicken is cooked add mix vegetable. Add one bowl size of rice and mix them well. Add Ketchup about 4 table spoons. That's it for the rice. Just like Omelette, let's cook eggs next. Used strong heat and cook eggs quickly. When eggs are cooked, add the rice and roll them up with eggs like this. Place Omu-Rice over a dish.